Weekly Photo Challenge: Transition | Oh, the Places We See . . . Seems simple,right? A kid wants to be a snow leopard. 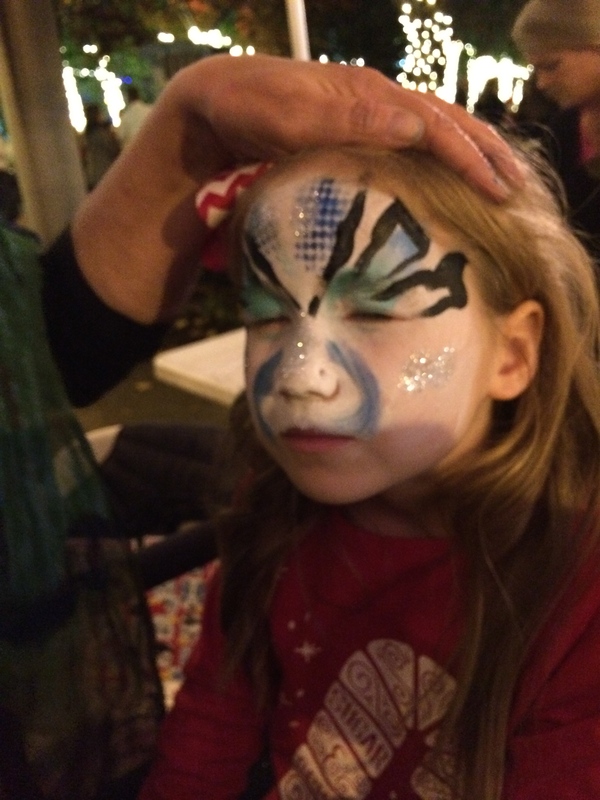 So she steps up to the face painting tent at Knoxville’s Christmas in the City. Selects Face Number 1 from the sample board. Sits down. Smiles at the artist. And the transition from kid to cat begins. With a white base, the artist adds color, definition around the eyes, whiskers. Then lines, whiskers, cat eyes and the like. Then, at the request of the “baby cat,” the artist adds fangs. Now you can qualify this display of art as nothing more than a common house cat look-alike. But don’t tell this little lady. With one big growl, she arches her back, hisses convincingly, and moves forward with claws out front. 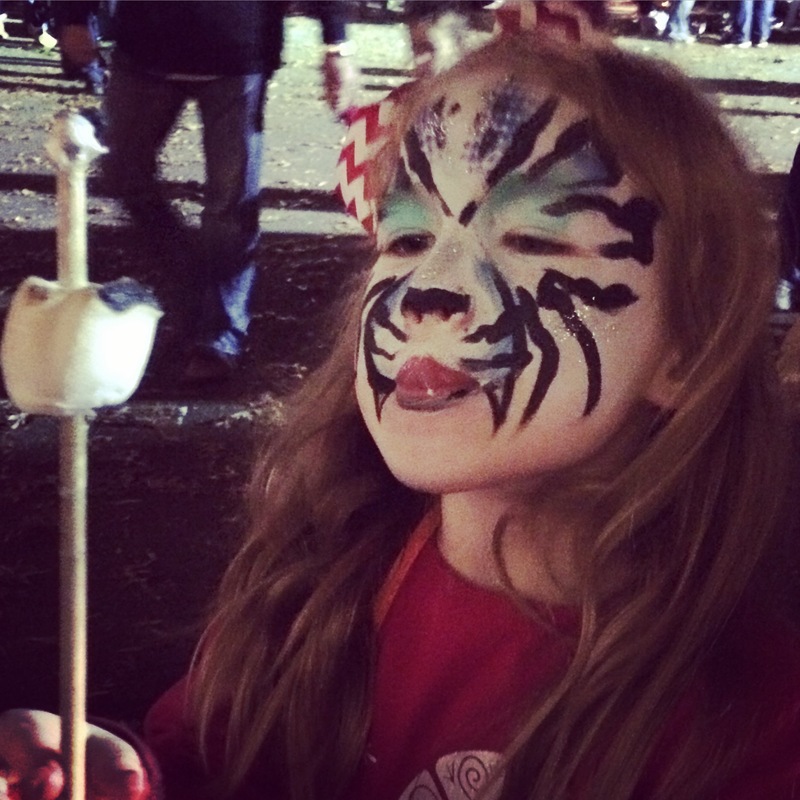 She wants to head immediately to the marshmallow roasting tent. We transition, too. After all, we don’t mess with snow leopards. Do snow leopards really eat marshmallows? Maybe. For more transitions, head to Weekly Photo Challenge: Transition here! Note: Many thanks to a very patient, creative Kelly Mules of Faces Gone Wild (www.knoxvillefacepainter.com) whose work you may want to check out. 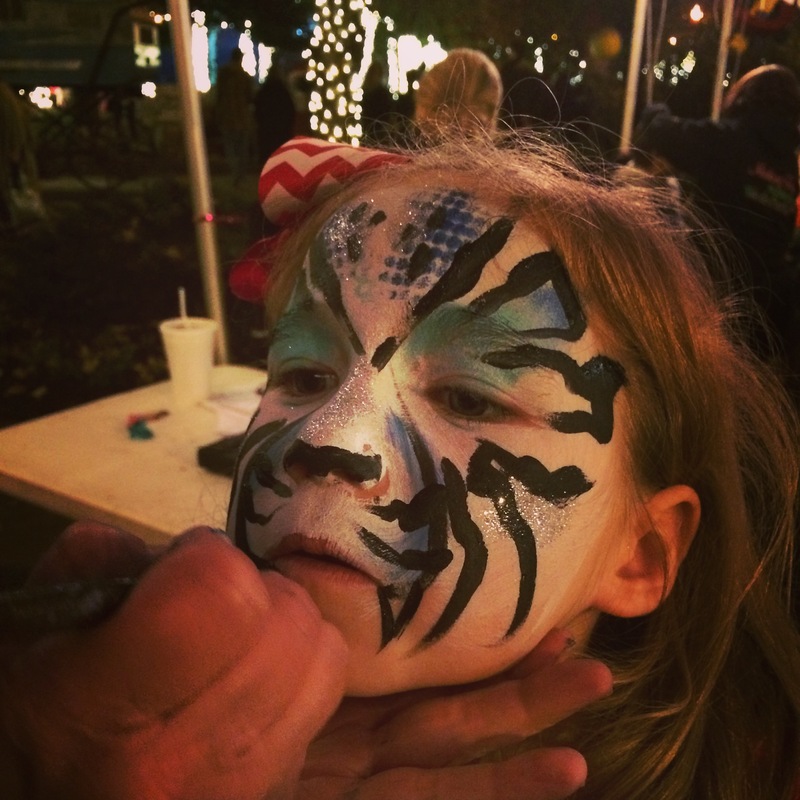 This entry was posted in Travel, Weekly Photo Challenge and tagged Christmas in the City, face painting, Knoxville, snow leopard, Weekly Photo Challenge: Transition. Bookmark the permalink. You win! This is by far the cutest transition this week. 🙂 Love your header photo. Thanks so much, Judy. We couldn’t believe how patient the artist was after three hours of standing and painting little kids! Glad it’s not my job! And thanks for the header compliment, too. Hope all your preparations for the holidays are going well. This is absolutely perfect for ‘transition!’ Excellent face painting as well. And darling little girl! Thanks, Dawn. 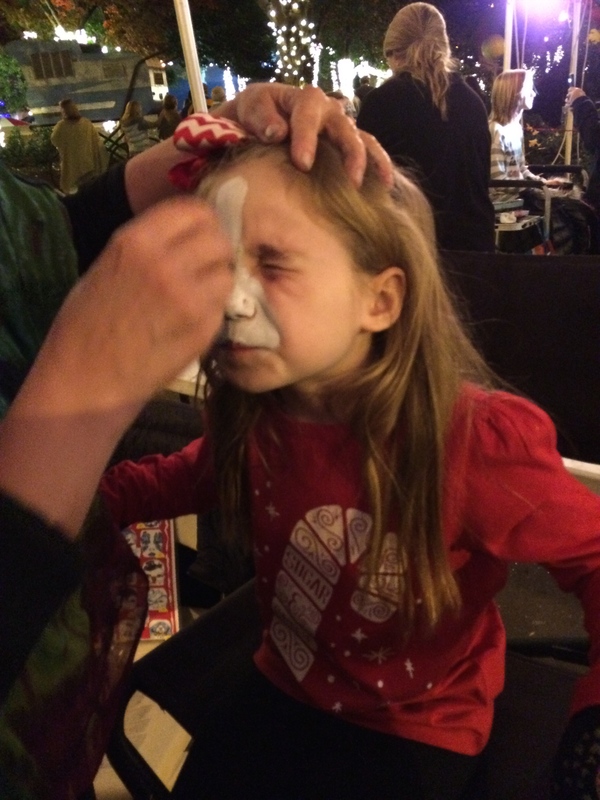 Our city’s kick-off to the holiday season offered great booths for kids. We’re in the spirit now! Looking at your pics make me miss that beautiful part of the country! I get to go back there (Knoxville & area) each summer and it’s a highlight of our year. But in the fall, there’s nothing like it! You’re making great memories! Thanks. Welcome to Knoxville each and every summer you can come. We have a thriving arts community, and there’s always something new going on. I’m glad I found your blog through the new Discover initiative of WordPress! 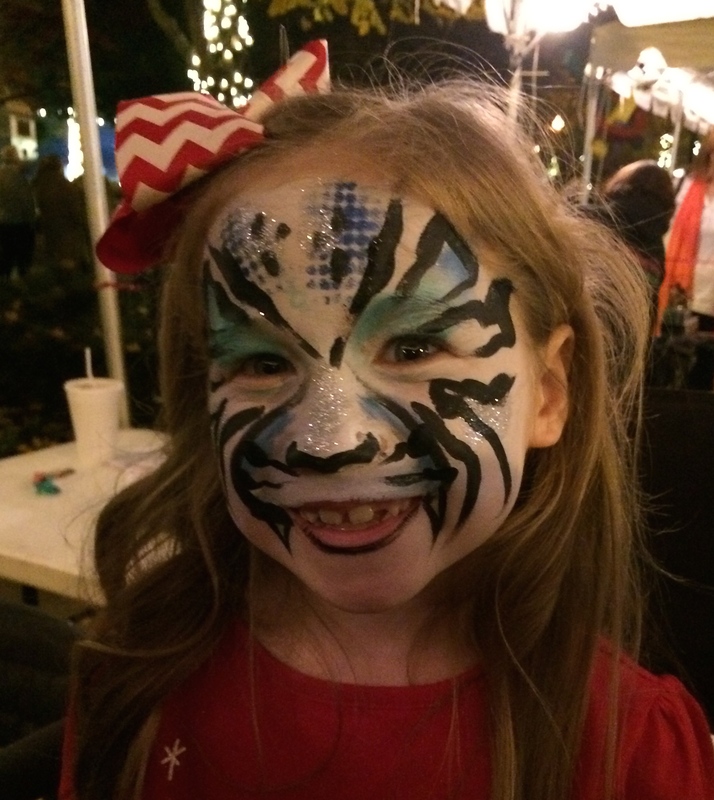 What a n excellent face painter! I totally agree! The artists said she does children’s birthday parties, and I was intrigued. Wouldn’t that be fun!! Thanks for taking a look and responding. I enjoy your blog. I may not always comment but I am here.